The second Tuesday of each month, we have a meeting at my upline, Phyllis' house. We have such a blast! I truly love to spend time with these ladies, sharing our love of this phenomenon called stamping!! Of course, it's "work" as I stress to my husband, Paul! Ha ha ha! I guess it's just awesome when you love what you do! And I certainly love it! This meeting was especially fun becau se, of course, we had the catalog to ooh and aah over! And Phyllis and I were able to share our experiences from the Leadership conference with everyone there. We were also very excited to be able to talk about the upcoming Sale-a-Bration Promotion. 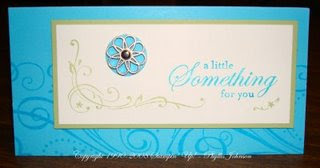 Phyllis created a couple cards for us to make using a few of these sets. Don't you just love these cards?? I do. She just rocks!! I can't wait for Sale-a-Bration to get here. It's probably my favorite time of the Stampin' Up! year because my very first Stampin' Up! workshop was during Sale-a-Bration. It brings back very happy memories and sparked this love in me that's still holding strong! I hope you enjoy what you do as much as I do. Check back tomorrow for some more fun stuff! 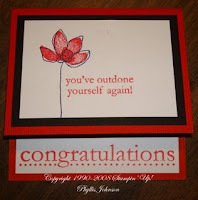 Until then... happy stamping! !